This fabulous 9 ac property offers 4 Bedrooms and an office with heat and air in one bay of garage. 4000 sf Insulated Shop space, with 220V power. Two 14x14 roll up bay doors with walk doors on each end. Office or living quarters with bathroom and shower. Attached on the barn side is 2400 sf 30x80 with a 16 ft isle. Two 12x12 bay doors and 10x12 side rollup for pasture access. Two 12x14 stalls and one 24x14 foaling stall. Insulated tack room, wash bay with tie-downs. 20x30 hay storage on the side with one 10x12 rollup and walk door. The eng. foundation is 8in post tension with approx 27 piers, plenty of strength to hold large equipment. This is an unbelievable opportunity to have built in equity at the first. Disclaimer: All information deemed reliable but not guaranteed and should be independently verified. All properties are subject to prior sale, change or withdrawal. 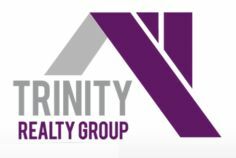 Neither listing broker(s) nor Trinity Realty Group shall be responsible for any typographical errors, misinformation, misprints and shall be held totally harmless.